Scholar & Co. - Educational Consultants in the best US Boarding Schools, Universities and Colleges. Admissions Consultants - We are different! We Turn Passion into Excellence! 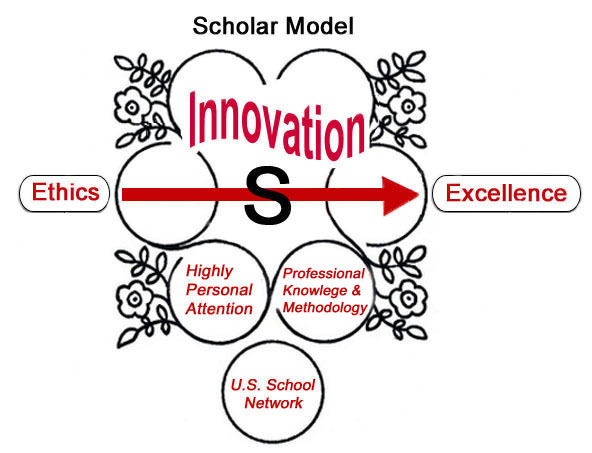 Scholar Model: From Ethics to Excellence! Scholar & Co. offers aspiring students a different approach, Scholar Model, to navigate in the complex world of getting admissions into U.S. boarding schools and colleges. Supporting students' best interests to pursue a quality US education is our motive. Scholar & Co. is fully committed to considering what would be best for a student from a parent's perspective - academics, future paths, personal development, care and support. We make every good faith effort and professional knowledge to effect a suitable placement in a best fit school for our students. We firmly believe ethics is of utmost importance and undoubtedly, being ethical is our greatest strength. Scholar & Co. adheres to the Principles of Good Practice of the U.S. independent educational professionals. Honesty is always the best policy. We abide by the highest ethical standards and understand how an admission committee assesses applicants. Following the western practices fulfills the admission requirements and is the best way to maximize students' admission chance. Our highest ethical standards and innovative methods lead us into excellent results: 100% success in boarding schools + 100% success in universities. * 100% of our students are able to enroll in a fine boarding school or university in the U.S.A.! * Most of our students are accepted by U.S. colleges of their first choice! We are award winning in creativity. We are unique in our innovative methods in 3 important areas: U.S. school network, professional team and methodology (See below - Part B.) Further, based on the student's character, capabilities, needs and aspiration, we strategize not only to build a unique profile but also to inspire creative essays in order to make a student stand out from the crowd. Our objective is to empower students' admission success into a school that is the best match and the right fit. Scholar & Co. is an award-winning, reputable U.S. educational consulting firm. We are not an agency and we are independent of any U.S. school - we are working entirely for the best interests of students. We are specialized in top universities and boarding schools in the United States. Admissions to these selective schools are highly competitive. We visited numerous schools on campus, therefore, we have sound on site school knowledge. We know schools and schools know us. The schools know we serve our students carefully and professionally. Our strong network of the top American schools is one of our greatest strengths. Our BEST OF BOTH WORLDS approach is unique in Hong Kong and China. We have 2 veteran consultants from both sides of the world. We work personally with students. Proactive, focused, ethusiastic and ethical, we are a strong professional team with the best combination of skills and a wealth of experiences from the east and the west. The combined skills and experiences translate into students' successes. In addition, we use meticulous, sublime methodology to match schools, control progress as well as quality, and ensure thoroughness, thoughtfulness and creativity in each task in the process. Education is best done when it is close to individuals. Everything matters so much in this complex process. To succeed, it is about highly personalized attention in great details for each student. We adopt the "one student at a time, and do very well for each student" approach to guide our students. We know kids well - we cure their procrastination amid their heavy workload, motivate them to achieve the best results before deadlines. Students, who are young, do need our unlimited guidance and support in this complex process. They get close attention throughout the process to produce perfect applications for admissions. Students not only get admitted to a school of their choice, but also learn a lot in the whole process. As a result, we are able to make great possibilities a reality!